Get insights into your home’s comfort with this small and unobtrusive sensor. It’s battery powered and completely wireless (unless you hook it up to the optional temperature probe). 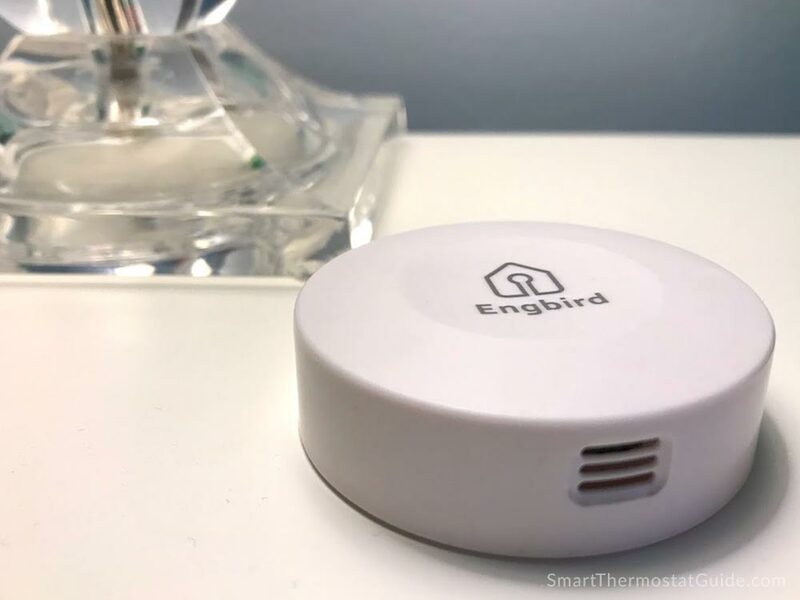 The Engbird Wireless Bluetooth Temperature and Humidity Smart Data Logger is a small, battery-powered sensor that passively captures data 24/7 and displays it in a neat, easy-to-read app. 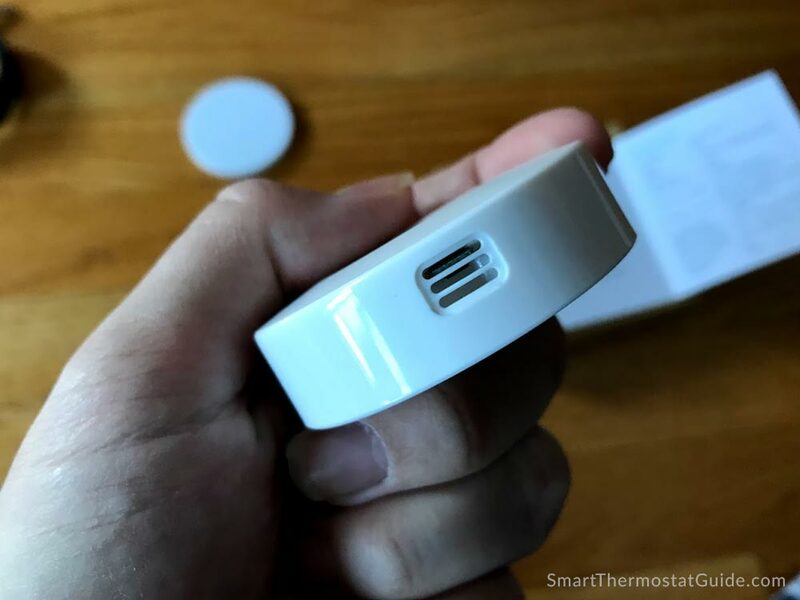 It’s easy to connect to the sensor via the app (note that you connect to it over Bluetooth, not WiFi) and the sensor holds about 20 days worth of data (depending on your sampling rate, which you can adjust). An optional wired probe lets you monitor temperature and humidity in a variety of places, including liquids, incubators, and cigar collections. The probe itself is waterproof, too, so you can dip it in a vat of whatever you’re making and track its temperature over time. 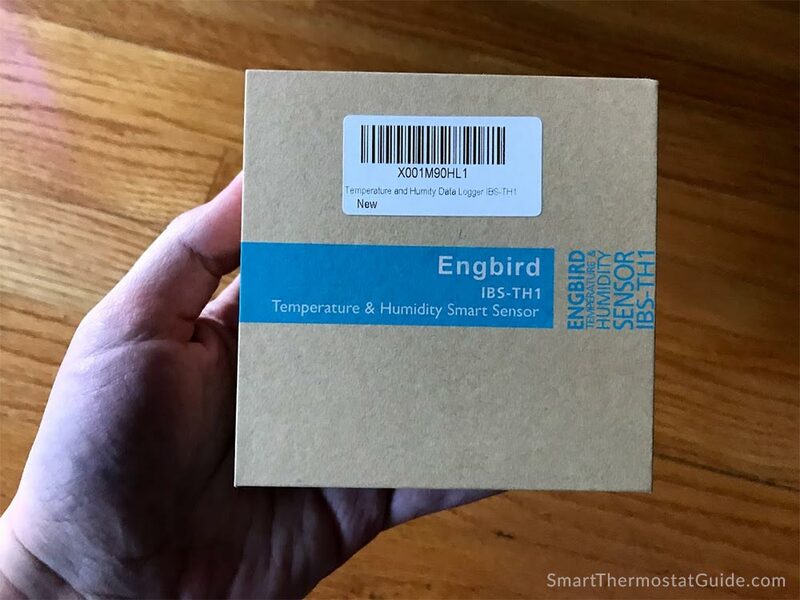 The Engbird temperature and humidity sensor is a lot like an ecobee room sensor! It doesn’t tie into your HVAC system in any way, but you can use it to get a better understanding of your home’s varying temperatures and humidity levels. It’s especially great for homes that can’t have one of the popular 24v smart thermostats (like homes with line-voltage heaters and many apartments and mobile homes) and would otherwise miss out on collecting and viewing this kind of data. 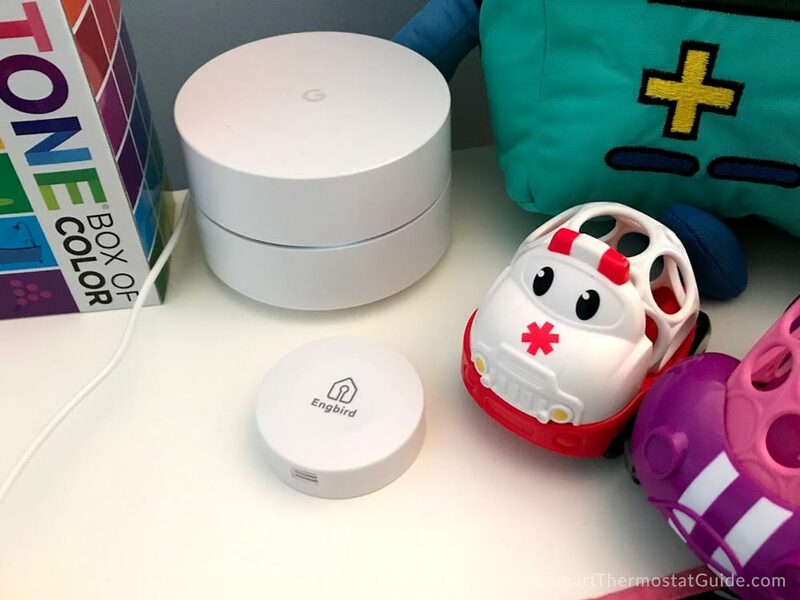 Since the unit itself is wireless and doesn’t need to be connected to WiFi or electricity to actively collect data, you can track the temperature and humidity of any place you can think of – inside your car, a shipping container, your office, your shed, you name it. Just remember that in order to get the data off the device, you’ll have to be near it with the app open on your phone. Monitoring range: 50 meters / 150ft (No obstructions). The Engbird sensor arrives in a petite cardboard box that is easy to open. Engbird sensor unboxed – the black wire is separate from the main unit, and the probe on the end of it is for extending the sensor’s reach. The probe is useful for measuring liquid temperatures and supports a wider range of temperatures than the main unit. The sensor is tiny! Here it is in my hand. The round port is for plugging in the optional probe (which is attached to a long black wire). These 3 holes are for the unit’s own temperature and humidity sensors. The sensor itself has no display, so you’ll need to download the app and turn on Bluetooth. Pairing is simple – open the app, add a new sensor, and it’ll find the Engbird unit automatically. Overall, setup was painless and took about a minute. We left ours in our toddler’s room, which has remained stubbornly cooler and more humid than the rest of the house. For this article, we left it running for three days before reconnecting to it to gather its data. Open the Engbird app (and turn on Bluetooth) to automatically connect to the sensor. The latest data is fed into the app in a process that takes a second or so. After three days, we had plenty of interesting data to look at, which is displayed in easy-to-read charts. The unit also tracks the most recent max and min temperatures, as well as an average. This makes it easy to just glance at the app and understand what’s going on. Connect via Bluetooth using the Engbird app to view recent data or dump a .csv (to a cloud service, such as Google Drive, or your phone’s own filesystem). After nearly a week with our Engbird, we’re quite happy to report that it’s been a positive addition to our home. We have one room at the front of our house that is stubbornly colder than the rest of the house, so having a temperature sensor in that room has helped us quantify just how much colder it is, and it has helped us observe effects of things we’ve done to remedy the problem (such as opening and closing vents throughout the house, opening the attached bathroom’s door vs. leaving it shut, etc). Since it’s currently winter, we’re also battling a condensation problem with the room’s windows. The moisture that’s pumped in from the humidifier attached to our central heating system isn’t evaporating in this cold room that never gets direct sunlight, so monitoring humidity levels has also been useful. When we see the humidity levels creep too high in this particular room, we know our HVAC’s humidity is set too high (even if it’s not too humid at our thermostat, which is at the opposite end of our house and in the sun half the day). We have another humidity and temperature reader we used to compare against the Engbird’s output. The two devices were always within 2 degrees or fewer of each other, and within 1-2% on humidity readings. The alerts are a nifty feature but you have to be near the unit in order to receive them. We didn’t make much use of the alerts for that reason. Engbird is small enough to sit on the window sill itself, but we generally keep it in the middle of the room. 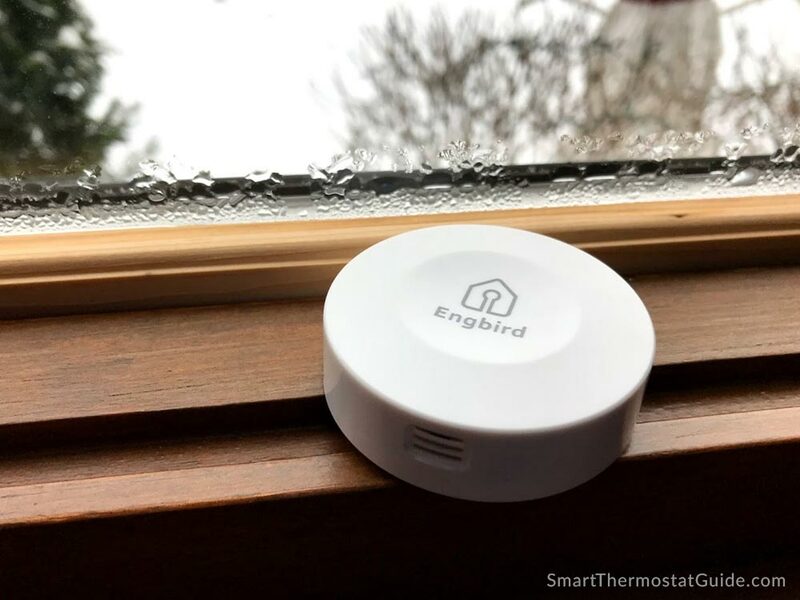 Anyone who needs to monitor the amount of heat, cold, or moisture in a particular location will probably be looking for a device like the Engbird sensor. Common uses include monitoring hobby rooms, greenhouses, collections (such as antiques or cigars), basements, attics, home brewing, children’s rooms, garages, wine cellars, and more. 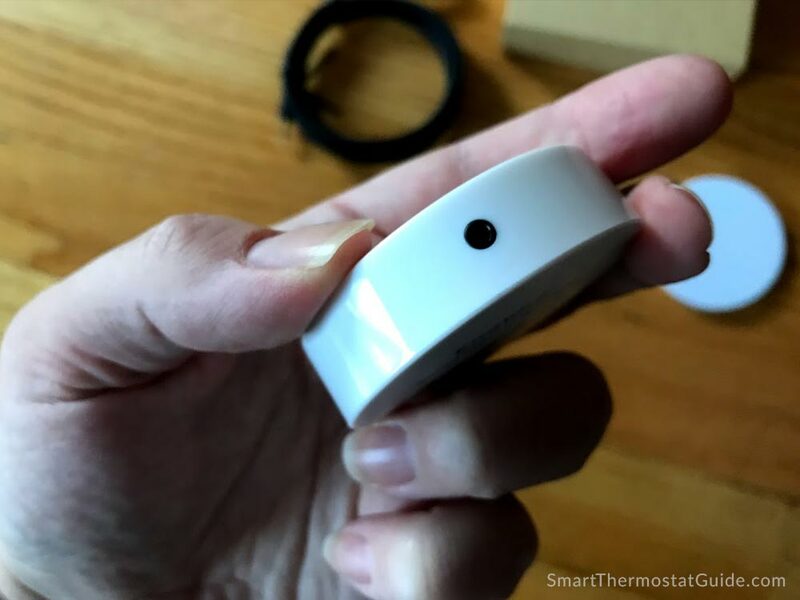 We currently live in the Midwest, where winters are dry and cold, so we use sensors like this one to monitor humidity in our home (too dry and we might feel itchy or get sore throats; too humid and our windows might develop ice on the inside). It can push alerts, but only if you’re in range of the device (roughly in the same room as it) and you have Bluetooth turned on on your phone. 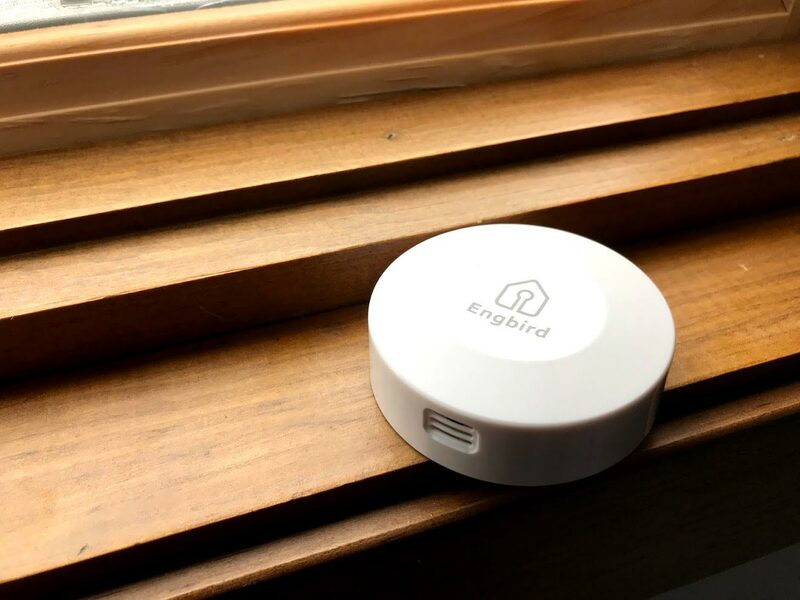 The Engbird sensor does not interface with WiFi so you cannot use it to remotely monitor a place – you must stand within several feet of the Engbird sensor to collect its most current data. If you need WiFi capabilities, check out the SensorPush and its separately-sold WiFi gateway. 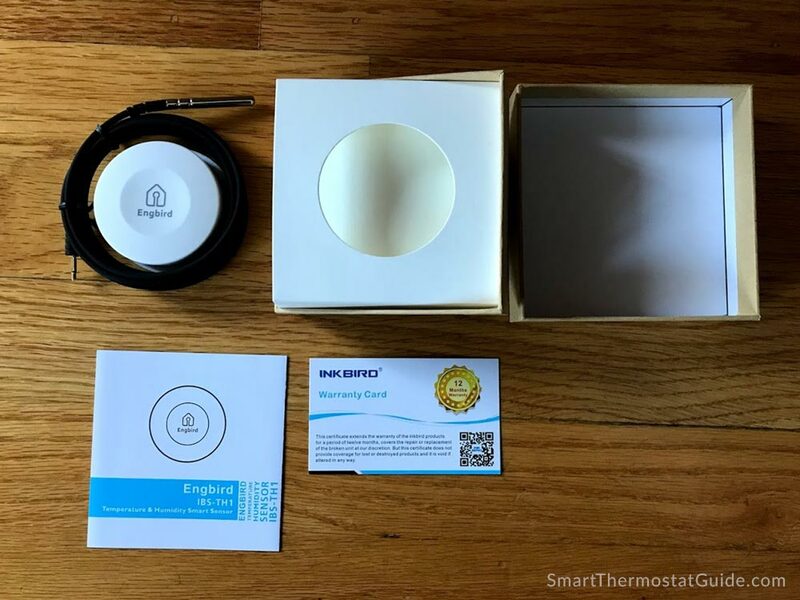 The SensorPush Wireless Thermometer is a similar product and one of the Engbird sensor’s main competitors. 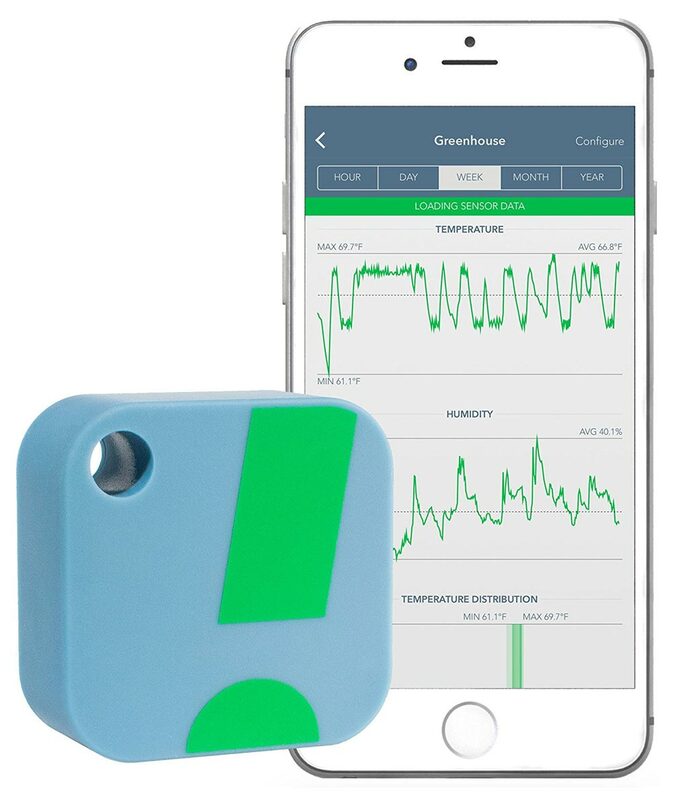 The general idea is the same: a small, Bluetooth-enabled sensor collects temperature and humidity data that you can view by opening the app (when in range of the sensor) and/or export for use outside the app. The SensorPush is similar but lacks the waterproof temperature probe. However, SensorPush can be paired with a WiFi gateway to add WiFi capabilities (sold separately). We have not tried the SensorPush – if you have, let us know what you think in the comments. Engbird only connects over Bluetooth, so you won’t get an alert while you’re away at the office that your home humidity are spiking. You must be near the device to collect its data. WiFi connectivity is a huge battery drain, though, so being Bluetooth-only is how this device runs on battery for a year+. The battery is replaceable but not rechargeable. This YouTube video shows you how to replace the battery (it’s simple). The Engbird Wireless Bluetooth Temperature and Humidity Smart Data Logger is a well thought-out device. 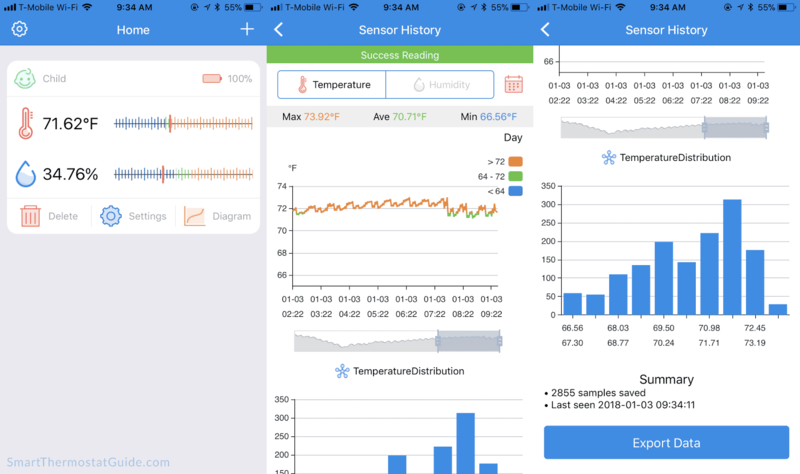 The app is easy to use and we immediately found the device useful for understanding ongoing temperature and humidity issues in our toddler’s room. If you love data, it’s easy to dump a .cvs file from the app onto your phone or cloud service of your choice. 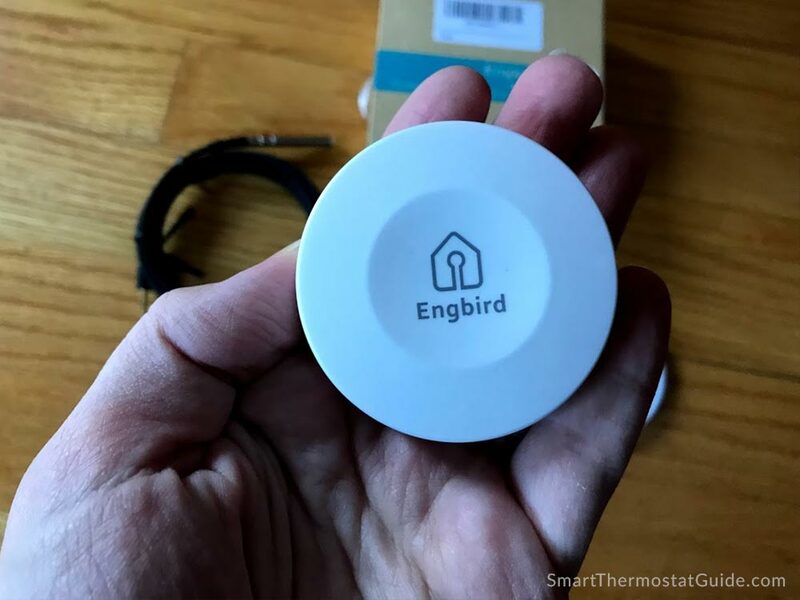 Sensors like the Engbird are especially great for homes that can’t install a smart thermostat for whatever reason and for homes that have the thermostat placed in an less than ideal location. For us, personally, trying the Engbird was a perfect opportunity to get aggregated insights into the temperature and humidity issues in our daughter’s room (which is at the north end of the house, where the sun doesn’t shine directly, and completely opposite of our thermostat, which is in the south end of the house facing a sunny window). 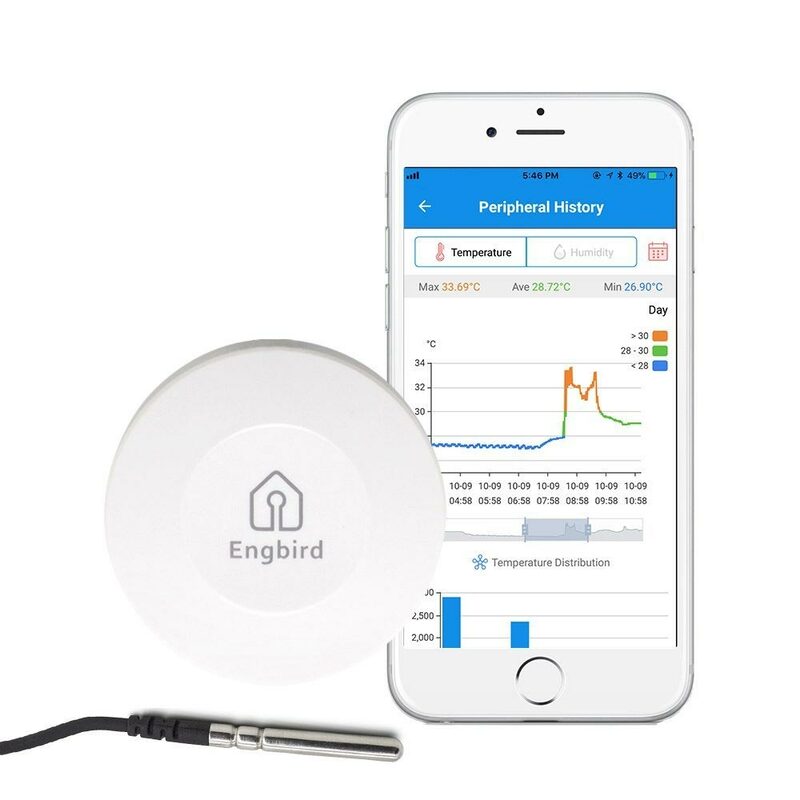 We highly recommend the Engbird Bluetooth Temperature and Humidity sensor to anyone who wants a more complete understanding of their home’s temperatures and humidity. I’ve been using SensorPush with the WiFi Gateway for about 18 months to monitor my greenhouse humidity and temps and it’s worked flawlessly. If you want/want the ability to monitor from anywhere at anytime the SensorPush is the way to go. If you don’t need that capability, the Engbird is half the price of of the SensorPush, not including the $150 Wifi Gateway and is a great option. My only complaint with the Engbird is it looks and feels really cheap, but at $25 I won’t complain too much. Did you know that now it’s possible to access the readings remotely too? And have alarms where ever you are! This is possible with Meazurem gateway and app. It works now with Inkbird IBS-TH1 sensors. Check it out from https://www.meazurem.com/.